Wild Atlantic Vista, luxurious property with amazing Atlantic Ocean views. Modern, spacious house with amazing ocean views - on large private site. Wild Atlantic Vista is a large 4 bedroom, modern house with lots of large windows which make the most of the amazing Ocean and island views. Wild Atlantic Vista is set on a large landscaped site with patio and gardens. The house is on an elevated site overlooking the ocean and Renvyle House Hotel golf course in Connemara, the most scenic part of Ireland. The hotel is a two minute walk away and has a small lively bar and award winning restaurant (non-residents are welcome). The White Strand Beach is only 5 minutes walk away and is perhaps the nicest beach in the area and perfect for sun bathing, walking, and surfing. The nearest shop and garage and two more bars and restaurants are a mile away in the small scenic village of Tully. The house is finished to the highest standard with Italian leather sofas in the double height sitting room with 42 inch plasma television and cinema surround sound as well as the most amazing views of the sea particularly at sunset when the Atlantic turns pure red. Golf: Renvyle House Hotel golf course is across the road from house. The Connemara Golf Links is 15 miles away. Beaches and surfing: The nearest beach is 5 minutes walk away and is great for surfing. There are numerous other beaches nearby. I live and work in the local area. My family is from the area and I love living in such a beautiful place. The views and location in Connemara. Unrivalled views of Atlantic Ocean and Islands. toilet, shower, Massage shower with jets. Both bathrooms offer luxury and high quality finish. Ocean Vista is an ideal location for a romantic getaway or a family holiday. Great location with beautiful views! Home is comfortable and welcoming! What a perfect place to enjoy a few days with friends and family! The rooms are cozy with comfortable beds and extra blankets and pillows. The kitchen is great of you want to stay in and cook, they have everything you need. The living room is great for a night in and has movies and board games along with a fireplace. The beach is a short drive away and is a must see! The town of Tully Cross is close by of you need supplies. They also have a great pub with phenomenal food called Paddy Coynes! Overall the stay was fantastic, I couldn't have wished for better. The owner is very responsive to messages and is there to help if needed. I would highly recommend this location! thanks very much for your review. I hope we see you again. With only four short days to visit Connemara, a friend and I rented Atlantic vista to serve as the home base for our time in Counties Galway and Mayo. While not out seeing the sights, and there are plenty within a reasonable drive, we spent our mornings having breakfast and tea gazing at the ocean from the kitchen and our evenings watching DVDs in the living room with a fire burning and again gazing at the sea. The cottage was clean and comfortable. The kitchen was well stocked with the necessary tools, dishes and pots/pans (I recommend a visit to the market in nearby Letterfrack for groceries and wine, though I picked up a nice preseasoned chicken to bake from the Lidl grocery store in Clifden as well). There is a fun and eclectic mix of CDs to listen to while in the kitchen or living room but after a few days you may be wishing for a few of your own. Snow Patrol was great for background music and Andrew CD (you'll know it when you see it) was a fun surprise. There's also a mix of DVDs available to watch but again you may want to bring your own. My only regret was that the weather wasn't a bit drier so that we could have enjoyed sitting outdoors more. When the sun peaked out it gave the views a whole new look. I will most definitely plan a trip back to this location in the near future. It's a winner! Thanks for your review. I really appreciate you taking the time to write it up and send it in. Went for a few days for a long St. Patrick's Day weekend. A dream holiday home, tastefully furnished with all the mod cons, set in beautiful surroundings on the Connemara coast. Lounge is a good sun trap and in the evening you can get the open fire going. Was exactly as listed, cleaned and well maintained. Couple of hours from Galway. Incredible hiking to be had nearby.Great value for money. Plus good craic in Paddy Coyne's pub down the road in Tullycross. The house was just as pictured. It had plenty of room for 6,2 adults and 4 children. The house was immaculate and everything we needed. The views were incredible. It was in a quiet peaceful location but close enough to get into town for things we needed. After traveling through Ireland this area was one of our favorites. The house had all you need to make it comfortable and fell like you are at home.. This was our first visit to ireland and I would stay here again when I return. The owner was informative and helped with any questions.. We left one of our bags at the house and she was so kind to ship it to us in another part of Ireland so we could have it within 1 day..So helpful.!!!!. The views from the kitchen every morning takes your breath away..so beautiful...Highly recommend this home to anyone. You will feel so happy to have chosen this home. Wild Atlantic Vista is in Renvyle in the heart of beautiful Connemara. The house has the Atlantic Ocean to the front and the Twelve Bens mountains all around with Letter Hill (a great hill walk) directly behind the house. White strand beach is 5 minutes walk away and there are many other lovely white sandy beaches a short drive from the house. Renvyle Hotel and Golf Course is 5 minutes walk and the bar and restaurant offer award winning food and lively atmosphere. Tully and Tullycross villages a mile and a half away and have a good choice of pubs, restaurants & shops. Kylemore Abbey is a great day visit and is only 10 minutes drive away. Connemara National Park and Diamond mountain are less than 10 minutes away and offer great hillwalking and visitor information. 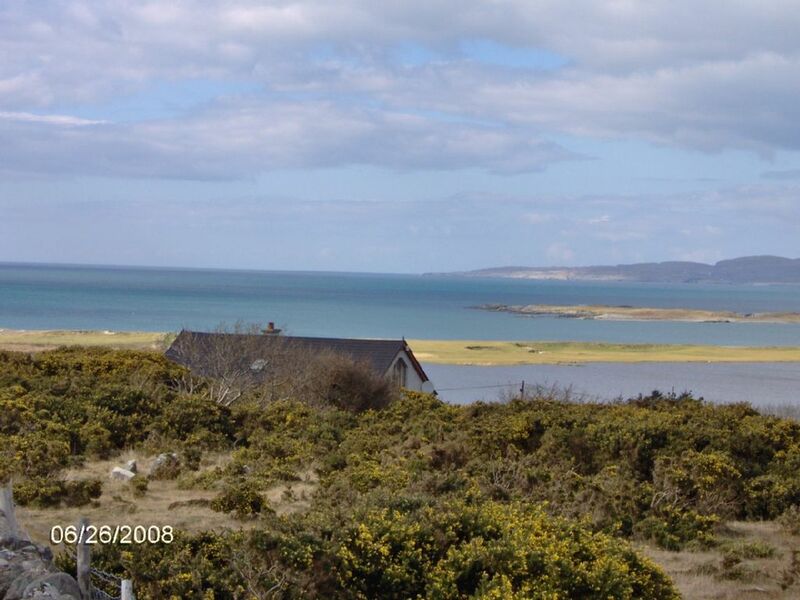 Clifden town 12 miles away is another must visit as is Inishboffin Island which can be seen from house. Leenane and Westport also offers a lot for visitors. The house and view are so beautiful and relaxing you can stay home and enjoy. Prices are inclusive of all linen, cleaning, heating etc.. No extra costs. Extra rates for Easter, Christmas and the New Year.